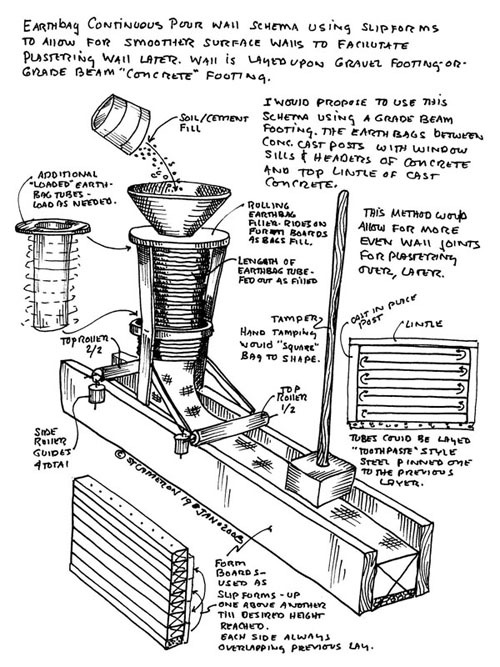 I recently got an email from Steve Cameron with the sketch shown below that he had drawn of a concept for filling and forming earthbag tubing into a uniform rectangular form on the wall being built. This is certainly an interesting idea, and a great drawing! I think that I understand your concept pretty well from the sketch. The squared bag shape would only retain that shape if the contents were solidified, as would happen with a soil/cement mix (which you specify); looser material would eventually force the bags into their more natural oval shape after the form were removed. But then, I wonder, why bother with using the bag material at all? What you describe is pretty classic rammed earth with lifted forms, and there would be better adhesion with rammed earth directly upon rammed earth rather than with the bag material intervening. If the purpose for forming the earthbags this way is mainly to reduce the work and material in plastering, I have to say that I don’t find the standard approach objectionable. All those crevasses between the bags give the plaster much better “tooth” than a smooth wall would, so there is an advantage to leaving these voids. 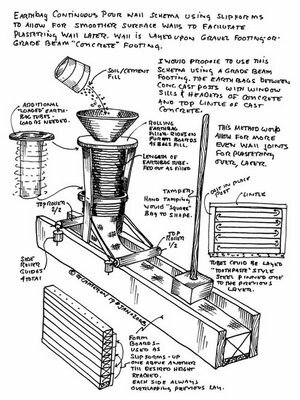 I should add, though, that the apparatus and concept is very clever, and shows great inventiveness; I suspect that it would actually function quite well as drawn. I might mention that rammed earth is often formed with slip forms done in lifts of maybe 2 feet. The proper soil mix is 15-30% clay and the rest sand. 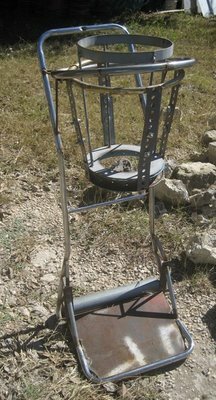 Sometime a small amount (maybe 5%) of Portland cement is added as a stabilizer, but not always. This is one area where earthbags have an advantage, because you can get away with a larger variety of soil mixes. Your suggested mix of 30% cement to 70% soil would be equivalent to a 3:7 mix of cement/sand concrete, which is very rich in cement! Standard soil cement mixes call for between 6 and 16% cement, depending on the specifics of the soil and the intended use. Then Steve wrote back that the device was actually inspired by a photo he had seen on a site featuring the Natural Building Colloquium in Texas in 2007, which he redesigned to suit his own needs.